For those who ask me, What can I do to help mySelf ? Negative Emotions Integrative Release is a powerful technique combining the aspects of Energy Healing and Time Line Therapy to provide healing release across all dimensions. This is one technique we use in our healing sessions. Integrative Release is our own proprietary product. To our knowledge, no one else is combining energy healing and gestalt therapy in one process. This process is designed to take you on a journey back to the time when a significant negative emotion was locked into your consciousness. This is a self-help technique for you to address any negative emotion that is currently impacting your life. Anger, fear, jealousy, grief, and most other negative emotions will respond to this. It cannot be described as a total intervention, nor is it a substitute for medical treatment. It is a powerful way of beginning, and continuing the healing process. Use it as many times as needed to peel away the layers you have built up. Some emotions will release easily, others will need more help. 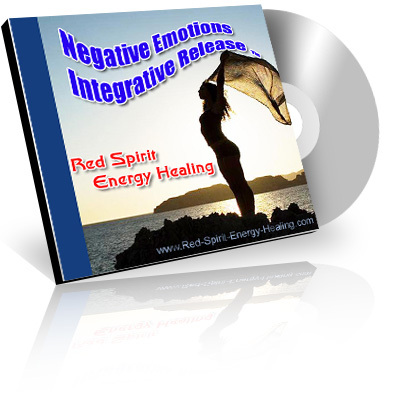 The Negative Emotions Integrative Release technique is the proprietary product of Red Spirit Energy Healing. 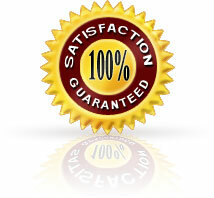 It's specifically designed on multiple levels for you to actively participate in releasing negative emotions. 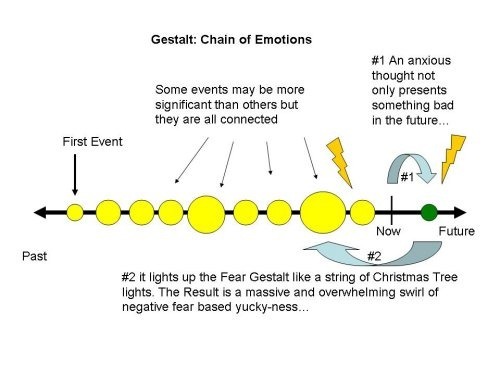 It's unique, combining Gestalt and Timeline therapy with understanding of Energy Healing. The emotion of fear is used as an example in the illustration below. A significant first time event is locked in the body and energy field. If not released, subsequent events begin to pile-up like pearls on a string or the lights on a Christmas tree. With the right trigger all those past experiences get fired off in one overwhelming cascade of emotions. The Negative Emotions Integrative Release process is designed to dissolve that string. With the right trigger, past negative experiences get fired off in one overwhelming cascade of emotions. Thank you so much for your service. I just purchased and tried the audio after reading the pdf. I was crying through the mp3. It made a huge impact in my emotions. Thank you so much. I had a very abusive childhood, and this helped me SO MUCH. I feel much better and can't wait to do multiple passes with other emotions. Just wanted to thank you for this. Thank you so much for your service. Purchase price for the Negative Emotions Integrative Release MP3 format only $35 AUD via PayPal online for immediate download. CAUTION: DO NOT LISTEN TO THIS AUDIO WHILE OPERATING A VEHICLE. IT IS DESIGNED TO INDUCE A HEALING STATE WHILE IN A PLACE OF SAFETY.